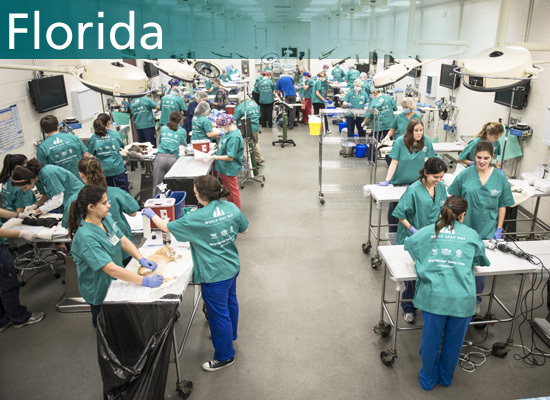 More than 90 volunteers spayed and neutered about 150 cats during the 2014 World Spay Day clinic at the University of Florida College of Veterinary Medicine. On Feb. 2, Barry Kellogg, VMD, senior veterinary medical advisor for HSVMA, joined Julie Levy, DVM, director of the Maddie’s Shelter Medicine Program at the University of Florida College of Veterinary Medicine, for Operation Catnip-Gainesville’s monthly spay-neuter clinic. The clinic is designated as a World Spay Day event. A team of more than 90 volunteers, comprised of veterinarians, veterinary students, veterinary technicians, and others sterilized about 150 cats in a few hours. Additionally, all cats received a rabies and FVRCP vaccination and had their left ear cropped to identify them as sterile. The World Spay Day team of volunteers at Madison College in Wisconsin. 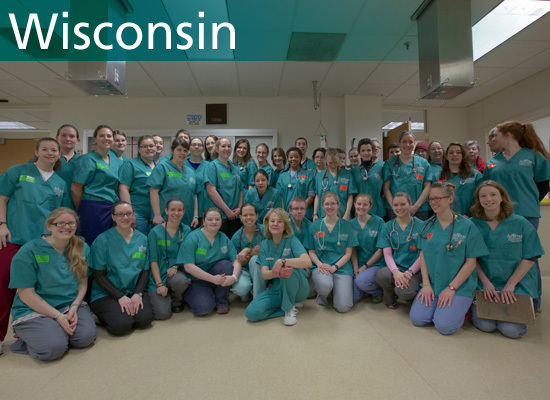 On Feb. 8, Susan Krebsbach, DVM, HSVMA veterinary consultant, joined over 50 volunteer veterinary professionals and students from Dane County Friends of Ferals, Madison College, Globe University, and the University of Wisconsin School of Veterinary Medicine, for a spay/neuter clinic at Madison College. Now in its fourth year, the World Spay Day partnership between HSVMA, Dane County Friends of Ferals and area universities has resulted in the sterilization of more than 300 community and free roaming cats. Third year veterinary student Aimee Lenz (left) makes notes as fellow third years Chloe Charlton (center-left) and Jackie Paritte (center-right) watch Penn Chinudomsub neuter a cat. 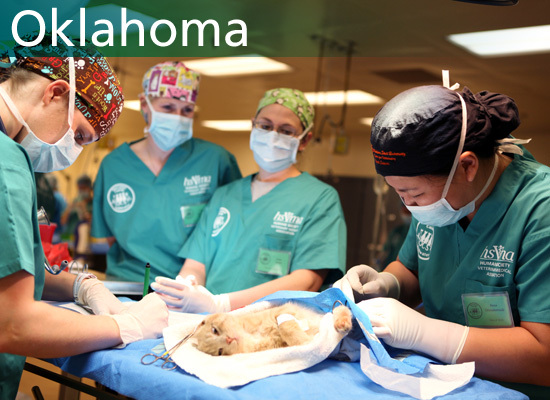 On Feb. 16, veterinary students from the Oklahoma State University College of Veterinary Medicine joined Dr. Lesa Staubus, clinical assistant professor of shelter medicine and surgery for another Operation Catnip event sponsored by the HSVMA at the OSU Veterinary Teaching Hospital. Using the efficient, high-volume process that Operation Catnip utilizes at its chapters across the country, the group sterilized 300 cats in one day. Dr. Staubus said: “Operation Catnip Stillwater provides a wonderful opportunity for veterinary medical students to gain invaluable hands on experience in a clinical setting. Students not only improve their clinical skills, but also leadership and teamwork. The collaboration between the university and the community to address the problem with cat overpopulation is fostering a culture of community service and improved animal welfare." 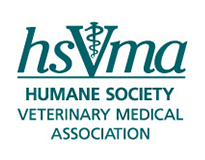 HSVMA works to improve veterinary students’ access to beneficial surgical training opportunities through direct care services, educational workshops and advocacy initiatives. Last year alone, the HSVMA Rural Area Veterinary Services clinics helped train more than 400 veterinary students while providing free medical care to over seven thousand animals in remote and underserved areas across the U.S. and abroad. More information on World Spay Day events can be found at worldspayday.org. Veterinary professionals can get involved with World Spay Day by visiting hsvma.org/world_spay_day.